Originally from Germany, Sina Theil started playing piano and writing songs at the age of 7, picking up a guitar at 18 and since flourishing into an accomplished recording artist. 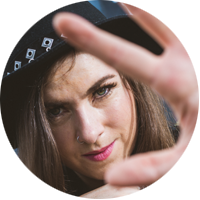 Sina left Germany for Spain where she played with a local Spanish band and recorded her first few demos, before finally arriving in Dublin to pave her career on the Irish music scene and becoming a student at BIMM. While making her way busking on the streets of Dublin, she gained experience in live performance as the front-woman of a rock group. In 2017 Sina was signed to Downda Road Productions and has since scored nine #3 singles in the Irish Country Download Charts including six #1 singles and her debut album "Under Cover" also charted at #1 in the Irish Country Download Charts and #5 in the Irish All Genre Download Album Charts. It is available on iTunes and all major Download Services and embodies a collection of songs that have accompanied her and her manager Mike Gleeson on the road while gigging relentlessly up and down the country for the past year. In 2017, she achieved a #2 in the Irish Country Download Charts with the single "Sam's Coming Home" which was recorded for Mayo based Childhood Cancer Charity Gearóid's Smile. The song was centred around Mayo's unsuccessful bid for All Ireland Glory. Sina's connection with Mayo GAA goes back to a chance recording of her reworking of "Galway Girl" outside McHale Park which went viral and received close to 100,000 views and resulted in a major increase in her popularity and constant gigging, especially in the West of Ireland. Sina's first release off the new album was a true Summer Anthem called "Here for the Party" (originally recorded by Gretchen Wilsons) which also reached #1 in the Irish Country Download Charts and was voted "Song of the Week" on Kfm. On the 22nd of August, she released track no. 8 "Crazy Women" which scored her another #1. To date, Sina's songs have been played on many Irish and UK based stations including C103, ClareFM, Midwest Radio, Midlands 103, Kfm, OceanFm, Radio Kerry, RedFM, Shannonside/Northern Sound, Highland Radio, BBC Coventry & Warwickshire, BBC WM, Galway Bay, LMFM, Tipp FM, WLR and many more. To date, her music has stacked up over 2.81 Million radio listener impressions and almost 1,020 radio plays in the Island of Ireland alone as registered by Radiomonitor. Another of Sina's original tracks 'Weight of the World' appeared on the Charity Album 'The Positive Touch' alongside songs from artists such as Paddy Casey, Mundy, The 4 Of Us, The Devlins, The Blades, Gavin Glass and more. During a very successful launch at The Workman's Club in Dublin, Sina gained great exposure as she joined Paddy Casey and Mundy on stage for a memorable performance and has been awarded "Song of the Week" on Highland Radio, KFm, Dundalk Fm, Way Out Radio UK, and Belgium Country Radio. More recently, she has been featured and interviewed on Hot Country TV & Keep It Country TV and appeared in RSVP Magazine, The Irish World, the Irish Mirror and various other press publications. We hope you enjoy Sina's music and for more information, don't hesitate to get in touch with us at contact@downdaroad.com and follow Sina Theil on Facebook.